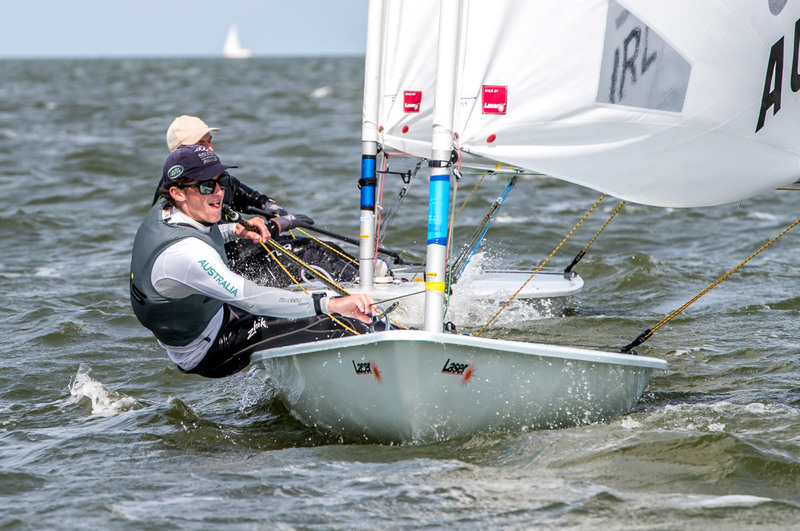 (Medemblik, Netherlands) – Two races were completed today in each fleet, concluding the qualifying series for the 2017 Laser Radial World Championships in Holland. The morning showed about 6 knots of wind on the IJsselmeer to send off the yellow fleet onto Race 7. As the sailors approached the first mark, the race was abandoned due to significant wind shifts. Racing was postponed until the wind direction settled. With the AP flag down, the yellow fleet set off on a clean start in about 10 knots. Gabriella Kidd (BRA) was the first to round the upwind mark, with Martina Bezdekova (CZE) and Marit Bouwmeester (NED) in her wake. Bouwmeester and Bezdekova were quick downwind and overtook Kidd, leading the fleet for the remainder of the race. After Bezdekova won the second upwind, Bouwmeester took off on the final downwind to secure first place. 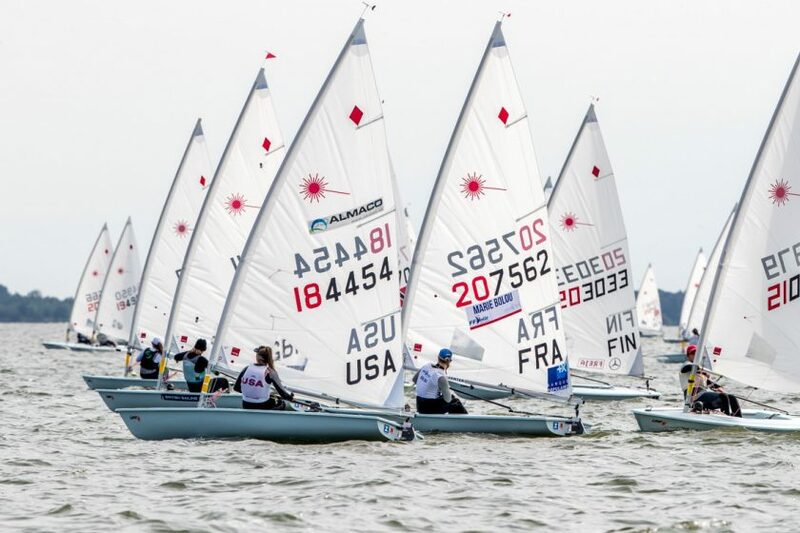 Bezdekova took second and Erika Reineke (USA) sailed fast into third. In Race 8, Team Netherlands was in the vanguard. Daphne Van Der Vaart (NED) rounded the first mark ahead of Bouwmeester and Reineke. But for the second time, Bouwmeester’s speed downwind had no match and she sailed into first. Bouwmeester maintained her lead to the finish, ahead of Van Der Vaart and Maxime Jonker (NED). The wind continued to shift right and built to about 15 knots. The white fleet started Race 7 after two general recalls, and Maud Jayet (SUI) and Tuula Tenkanen (FIN) immediately took off in the heavier conditions. Jayet maintained first, protecting her position around the entirety of the course. 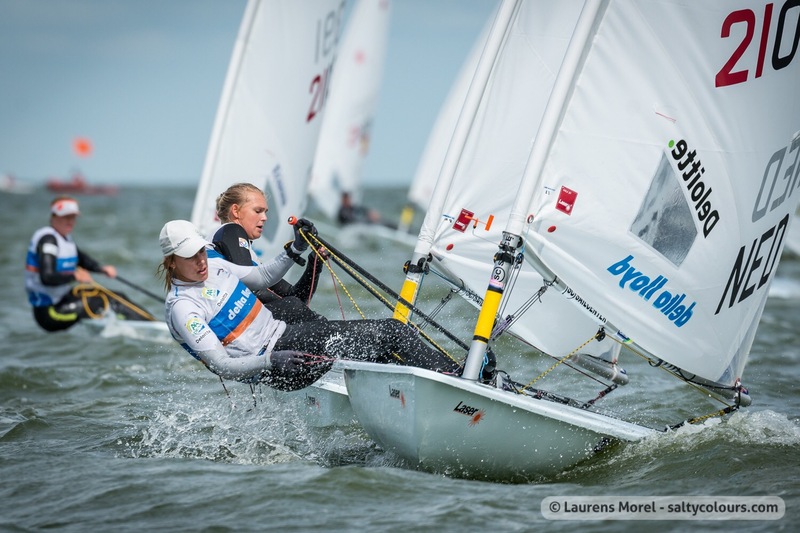 Tenkanen sailed into second, and Evi Van Acker (BEL) also found speed in the breeze and claimed third. Race 8 for the white fleet had distinct leaders separated from the rest of the fleet by the final downwind. Anna Munch (DEN) sailed in her own breeze ahead of Haddon Hughes (USA), who also created a sizeable distance from Evi Van Acker (BEL) in third. In the shifty wind today, those that stayed in phase kept the fleet behind them. “The times where I actually extended on some of the fleet were the times when I was just looking all around me,” explains Reineke. “The times that I lost were the times a shift caught me by surprise.” Van Acker was one such sailor who stayed in phase, sitting in first place overall with 27 points. Bouwmeester has climbed to second with 41 points, and Manami Doi (JPN) is in third with 48 points. In the men’s fleet today, the most notable performance was from Zac Littlewood (AUS). After rounding the windward mark in fourth, behind Maxime Mazard (FRA), Scott Syndey (SGP), and Marcin Rudawski (POL), Littlewood worked into first with a significant lead by the final downwind. Littlewood finished ahead of the fleet, with Mazard and Daniil Krutskikh (RUS) taking second and third, respectively. Eliot Merceron (SUI) secured the win for Race 8, but Littlewood was right behind in second, and Ronan Wallace (IRL) in third. With the qualifying series now complete, sailors will now be allocated into Gold and Silver Fleets for the final series. Racing continues tomorrow with 2 races scheduled.